This trip was going to be a challenge from the beginning. We had scheduled a Danube River cruise for just after Thanksgiving but we also had two Caribbean Cruises scheduled to begin just after the river cruise and then we'd have our snowbird season in Key Largo after that. A packing nightmare to say the least. Winter clothes plus warm weather clothes plus dressy clothes for the holiday cruise and added to all of that just regular clothes for our Key Largo time along with the usual odds and ends that we both enjoy having at hand while we're there (Bob's radio for one, my crock pot for another). We set off to drive to Miami the Sunday after Thanksgiving. We always make it a three day drive with our usual stops in North Carolina and North Florida. Every inch of the car was packed tightly. After one more night in Fort Lauderdale, we drove to Miami and boarded our Austrian Airline flight to Vienna. The flight from Miami was direct so we had no connections to worry with. The temperature was a sunny 80 degrees as we checked our luggage full of sweaters and winter coats. For once I was able to sleep on the plane and as we were wakened for "breakfast" I felt pretty good. Breakfast was a large muffin that looked more like a small dry cake but the coffee was good. The plane descended for landing. The closer we got to the ground the more it was obvious we were landing in the middle of heavy snow. I closed my eyes. Miami - 80 degrees and sun. Vienna - 34 degrees and snow. This was crazy. We collected our luggage and found our way through the subway system to our hotel in the heart of Vienna. 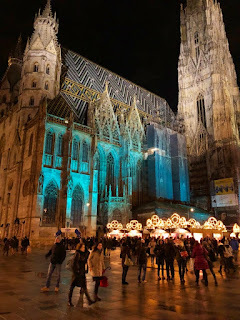 The hotel was near a beautiful cathedral and a Christmas market--which was why we were there, to see what the Christmas Markets were like. Luggage deposited in our room which was luckily ready for us, we set out into the cold and now rainy weather to explore.